Truckee and Lake Tahoe are world class destinations for trail running and racing. I feel pretty lucky to live in Truckee and explore these trails as often as possible. If you don’t live here signing up for one ore more of these runs is a great way to stay safe and have support while exploring the beautiful Sierra Nevada mountains. I also recommend checking out local running clubs like the Donner Party Mountain Runners and becoming a member if you want to do training runs and get more familiar with the area. 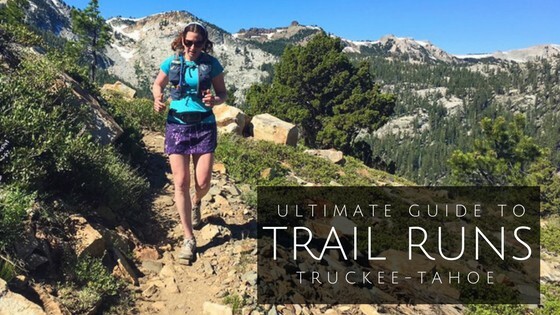 Best trail runs and races in Truckee and Lake Tahoe for 2019. Signup and start training! The Carson Canyons Half Marathon is the first of 3 races in a Half Marathon Series put on by Ascent Runs. This trail run starts and ends at Long Ranch Park in Carson City making it great for the whole family to come hang out. Runners use some paved roads then mostly dirt singletrack trails rolling through the lower foothills of the Sierra below Lake Tahoe. The course provides spectacular views of the mountains and Carson City. There are two distances runners can choose from- a full half marathon of 13.2 miles or a half half marathon which is 6.7 miles. Runners of both distances and all abilities will enjoy the mixed terrain of this course. After record snowfall over the winter the trails are sure to be in excellent condition, with flowing rivers and early spring flowers. This is a great race to kick off your season! For more information, to register and for other race information – check out Ascent Runs. Their mission is to create and host challenging, fun and memorable trail running experiences that promote the natural environment of the Tahoe Basin and contribute to the success of local businesses and communities. I’m all for that! The Silver State 50 Miler and 50k are celebrating 32 years of Endurance Runs this year and eight years for the Trail Half Marathon. The 50/50 has a long and rich history as one of the most challenging trail runs on the West Coast. The 50/50 offers a wide variety of terrain for all types of runners, with plenty of climbing and descending. 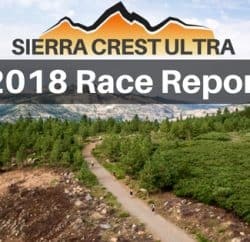 The course has enough dirt, rock, pine trees, excellent single track, altitude and exquisite views of the Sierra Nevada and the Truckee Meadows to satisfy the demands of runners who yearn for a fun, challenging day. 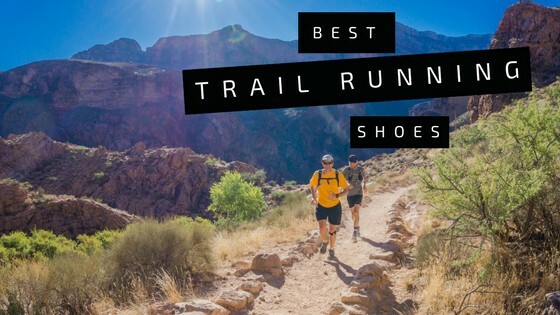 Both the 50-mile and 50-kilometer races are considered excellent trainers for the Western States 100-miler and the Tahoe Rim Trail 100-miler. The trail half-marathon provides 13.1 miles of single track, with climbing and descending through some of the most memorable country in the West. No matter what event you choose, you will find a well-marked course, friendly volunteers, lots of nourishment as well as salty and sweet goodies at the aid stations. There is also great post-race fun, food and drink at the finish at Rancho San Rafael Park. There are seven aid stations for the 50k and 12 for the 50-miler. The course is run 100 percent on dirt trails and dirt roads. 50-miler runners will climb and descend 9,500 feet, 50k runners will climb and descend 6,100 feet. The highest elevation on the course is 8,266 feet and the lowest point is 4,700. In addition to online registration they will also have in-person, day-before and morning of registration but I don’t recommend waiting. Click here for more details about this challenging race. 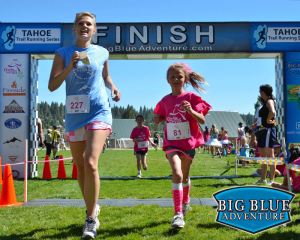 The Truckee Running Festival is a fun event for the whole family. This festival features a 5k and 10k along the Legacy Trail and a half marathon that winds through the scenic Waddle Ranch trails. There’s also fun kids races of various lengths. The 5k is a fundraiser for Girls on the Run Sierras, a local non profit that helps girls build healthy, lifelong relationships with health and fitness and discover inner strength and confidence through an activity based curriculum. 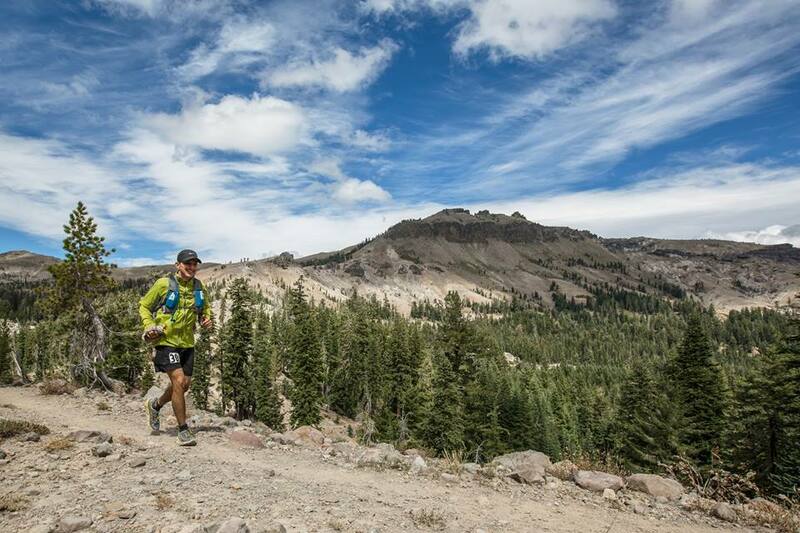 The Broken Arrow Skyrace, presented by Salomon, is a two day event held at Squaw Valley. 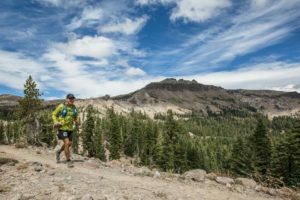 The race features off-trail scrambling on steep terrain with huge vertical gains and losses at altitude in three different distances: 52K, 26K and Vertical K. Runners will enjoy spectacular views of Lake Tahoe and Squaw Valley’s high-alpine terrain. This race traverses famous Squaw Valley Ski Resort. After the race participants can enjoy food, beer, music, films and fun activities. This race is part of the US Skyrunning Series. 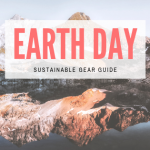 Check conditions and make sure you have the right gear for this race. The Western States 100 Mile Endurance run is the world’s oldest 100 mile trail race. It starts in Squaw Valley, California, and ends 100.2 miles away in Auburn, California. Western States, in the decades since its inception in 1974, has come to represent one of the ultimate endurance tests in the world. Following the historic Western States Trail, runners climb more than 18,000 feet and descend nearly 23,000 feet before they reach the finish line at Placer High School in Auburn. In the miles between Squaw Valley and Auburn, runners experience the majestic high country beauty of Emigrant Pass and the Granite Chief Wilderness, the crucible of the canyons of the California gold country, a memorable crossing of the ice-cold waters of the main stem of the Middle Fork of the American River, and during the latter stages, the historic reddish brown colored trails that led gold seeking prospectors and homesteading pilgrims alike to the welcoming arms of Auburn. For more than four decades, Western States has been home to some of trail running’s most stirring and legendary competitions, and has spurred the capacity of the spirit of all runners, of all abilities and from all walks of life, from all over the globe. 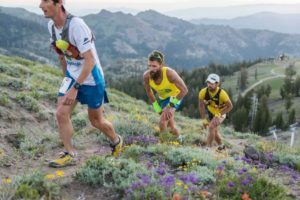 Western States is the pinnacle of 100 ultra runs. You need to enter a lottery in advance to get a spot in this race and demand is high. You are stoked if you get in! For more information about the lottery click here. Burton Creek is sure to be raging this year after the record snowfall this past winter. Runners see and hear the creek often as the trail rolls through the alpine forest. This year also holds the potential to have spectacular wildflowers, if the snow melts in time. Check out this challenging and fun course. The Burton Creek Half Marathon is one of the best Lake Tahoe Half Marathons and fun for the whole family. They have age appropriate distance kids races for those 4 and older so everyone can have fun running. Check here for all the details including schedules, course preview, pre-runs for the course. After the race enjoy great swag and awards that include a free digital race photo, post event festivities, music, beverages, recovery food like fruit and bagels, and medical staff on hand. This run starts at Davis Creek Regional Park in Washoe Valley and climbs 5000’ in 10.5 miles to the top of Slide Mountain. The course begins with a gradual rise that traverses the lower contour of the mountain. This introduction doesn’t last long before the climbing gets steeper and more technical especially after crossing Ophir Creek just a couple of miles into the trail. After crossing the creek, runners will continue uphill past intersections for Rock Lake and Upper Price Lake staying on the Ophir Creek Trail. Once above Upper Price Lake, the climbing starts to become more moderate and eventually easing just before connecting with the Tahoe Rim Trail. The TRT takes runners across Tahoe Meadows up the TRT trailhead parking area along Mt. Rose highway. The course then continues across the parking area onto the Tahoe Meadows Interpretive Trail leading everyone to Mt. Rose Campground. There is a brief section of pavement through the campground before accessing a dirt road that climbs steeply up the backside of Mt Rose Ski Area to the top of Slide Mountain at 9698’. Here at the top, the views will take your breathe away if the elevation already hasn’t! Runners then retrace their steps back to the finish at Davis Creek Campground. This is a challenging trail with some very steep and technical sections that make it difficult to run, even downhill. This run is part of the Ascent Peaks Tahoe Dirt & Vert Series of uphill runs. The series is designed to tour some of the best dirt and vert around Tahoe with lots of fun and prizes! The two other runs in the series are: Genoa Peak Marathon on June 9, 2018 and Capital Climb on August 4, 2018. Complete all three events for an ADVENTURE UP prize. Check out all the details here! This run is going to be epic! Sign up now for the inaugural Lost and Found 30K/5K designed by Peter Fain of Run On Dirt. From the abundant wildflowers to the Summit of 9000ft Castle Peak with 360′ views of the beautiful Sierra Nevada Mountains, you will be inspired by the beauty and tested by the difficulty. Whether you are looking for a rugged course that will prepare you for mountain races like TRT100/55 and Castle Peak100k or you want to discover the magic that awaits around this high alpine route, we will guide you safely on this journey. Soon to be known as on of the most scenic and rugged trail races, the Lost and Found 30k/5k has something for everyone. The 30k is a modified loop course. The start/finish is at the Johnson Canyon trailhead above Donner lake. 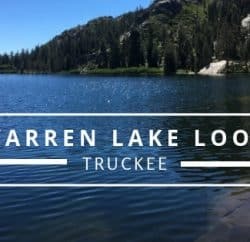 Starting with a steep climb up to the Donner Lake Rim Trail, along picturesque Summit Lake (Aid1 mile 3.7), winding through ancient granite slabs and then joining the Warren Lake trail which continues to climb up next to the Frog Lake overlook. You then fall off the ridge where you find miles of wildflowers and little streams as you make your way through this pristine alpine valley. The climb up to Basin Peak (Aid2 mile 8.8) will test your mettle and then follow along the most amazing ridge with 360′ views from the Coast Range to Mt Rose where you summit Castle Peak. 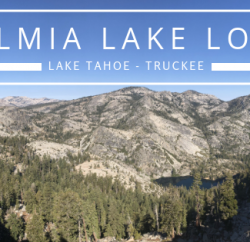 Enjoy the views before you plummet down to Castle Pass (Aid3 mile 12), hop on the hole in the ground trail and head down to the Donner Lake Rim Trail (Aid4 mile 15.5) back to Johnson Canyon. Aproximately 4550 feet of vert, 4 aid stations and a great post race party await. The 5k is a single loop with about 823 feet of climb, great views of Donner lake and the Pacific Crest. Come and see why trail running is so addictive! You won’t be disappointed! The Tahoe Rim Trail 100 Mile Endurance Run is one of the absolute best Ultra runs in the country! This race will be run on single track trails and dirt roads within Spooner State Park and on the Tahoe Rim Trail located within the state park and on National Forest land all at or above 8,000 feet of elevation. The 100 mile race will simply be the 50 mile course run twice. But make no mistake, there is nothing simple about the 100 mile course. Please refer to the event website for a course description, elevation profile, and finishing times to get a better perception of the difficulty of this course. All runners must be sufficiently prepared for all trail and environmental conditions. Running any 100 mile race is a true challenge physically, mentally and emotionally. Don’t expect to run a PR here. DO expect to find the finest aid stations in ultra running, epic scenery, and world famous volunteers. Due to high demand for this incredible race, the Tahoe Rim Trail Endurance Runs (all three distances) has gone to a lottery registration. For more information about this race check out the Tahoe Mountain Milers Running Club. 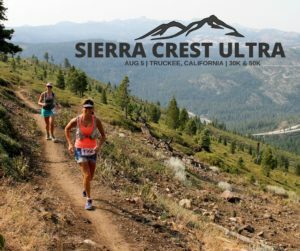 The Sierra Crest 30K and 50K is an exciting point to point trail run that takes advantage of some of the Truckee and Donner Summit area’s best single track trails. 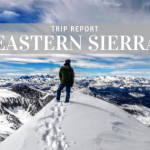 The courses offer scenic views of some of the Northern Sierra’s most stunning terrain, including the Euer Valley, Frog Lake Cliffs, Summit Lake, Castle Peak, and other incredible peaks of the Sierra Crest. The 30K and 50K courses take advantage of Tahoe Donner’s extensive trail system, the Auburn Ski Club (ASC) trails, as well as the Donner Lake Rim Trail as they literally cross the crest of the Sierra Nevada Mountains. The event is unique, and so are the courses – there are no repeated trail segments in any of the courses! Starting at Tahoe Donner’s new Alder Creek Adventure Center, and finishing at Auburn Ski Club Training Center, at the western terminus of the Boreal Mountain Resort’s parking area, the point-to-point 30K and 50K runs offer a challenging, but manageable route across the crest. Shuttles ($15 per person) from ASC to Tahoe Donner keep the logistics easy and allow racers to focus on their running. Last year was the first year for this race and this year’s event looks to build on last year’s strengths with minor improvements to the course, improved depth of field, and even a new distance! 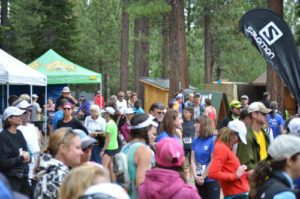 New this year, the 15K course starts, and finishes at The Alder Creek Adventure Center in Tahoe Donner. The course follows the first stage of the Sierra Crest 50K Ultra Run down to and around the beautiful Euer Valley and back. The 15K race will begin at 8:10 am, right after the 30K race begins. Click here for all of the race information including maps, pre race information and more. Tahoe Rim Trail above Marlette Lake and Lake Tahoe. Photo by Rachel Mccullough. The Marlette 50K is a truly adventurous romp through some of planet earth’s most scenic and challenging trails. 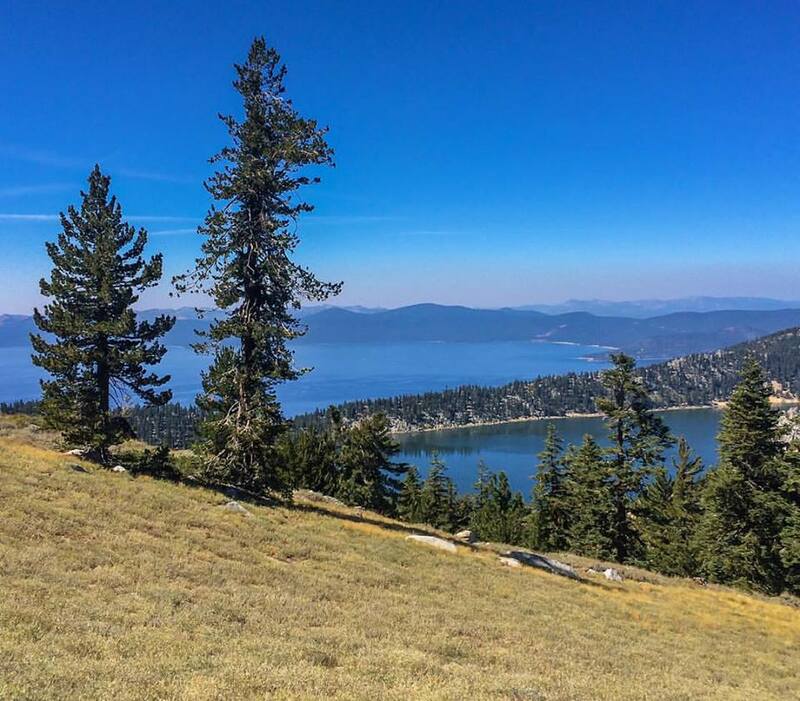 Based at Spooner Lake in Lake Tahoe Nevada’s State Park the run features 30 miles of epic trails and views. Think prime Sierra single track and add in 360 degree panorama views of Lake Tahoe, the Carson Valley and Carson Range. Marlette Lake lies in the middle of the course and if you’re heating up during the run feel free to take a plunge. The Marlette 10 Miler starts at Spooner Lake and heads north on the North Canyon Trail. Then heads along the south shore of Marlette Lake featuring views of the canyon and Snow Valley Peak. The 50K course boasts 5353’ of elevation gain and 5389’ of loss so this race is guaranteed to be a challenge. If you didn’t sign up for one of the Tahoe Rim Trail runs this might be a good alternative. Click here for more information. Experience dramatic scenery, demanding trails and genuine support on this point-to-point mountain course. 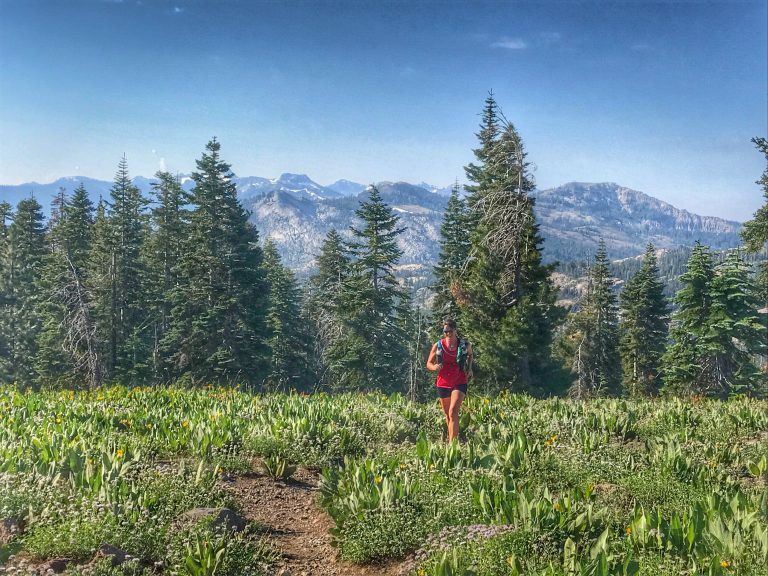 The Castle Peak 100k trail race starts near the historic Donner Camp in Truckee, California, where runners will climb and descend some 14,000 feet at an average elevation of 7,100 feet. The course tours the Tahoe National Forest, Tahoe Donner, Donner Lake Rim Trail, Basin and Castle Peaks, Royal Gorge and Sugar Bowl before descending Cold Stream Canyon to finish at Donner Memorial State Park. Please be advised that the course includes a 1.25-mile section (the Palisades) of very technical, risky and exposed scrambling and may not be appropriate for those with a fear of heights. Click here to view all of the details on the Castle Peak 100k website. Castle Peak 100k is produced by the Donner Party Mountain Runners, an all-volunteer non-profit organization. Their mission is to inform and inspire mountain runners in Truckee-Tahoe. Check them out and become a member today. Here’s a race report to get you inspired! Castle Peak 100k is a Western States Endurance Run qualifier and 2019 finishers earn 4 points towards 2019 Ultra-Trail du Mont-Blanc Qualification. New for 2018 – the course will be run clockwise which is the opposite direction of previous years. 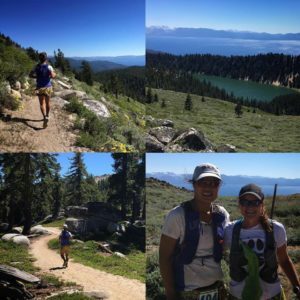 The Tahoe 200 is the first and only 200 mile single loop mountain trail race in the United States! The event has 35,117 feet of climbing and a total of 70,234 feet of elevation change. This incredible route circumnavigates the sparkling, clear blue waters of Lake Tahoe from the Tahoe Rim Trail. The race occasionally detours off the TRT to explore aspen meadows, rock gardens of giants, small and impossibly blue lakes, thick canopied forests, and long ridge lines with stunning views of Lake Tahoe. The course is nothing less than magical. There are 200 spots for the race and it’s full for 2017. Registration opens sometime in November each year so signup to get a reminder if this race is on your bucket list because it sells out quickly each year. For all race information click here. This race is put on by Troy’s California Trail Runs and is part of a series of races in South Lake Tahoe. It’s a great way to take in fall colors and get on technical, rocky terrain. The course is part single track, part dirt road, and 5% pavement. 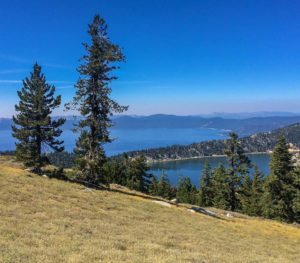 Called “One of America’s Most Scenic Trail Runs” by Competitor Magazine, this trail run is defined by both the incredible beauty of Lake Tahoe and the towering peaks of the High Sierra. The Emerald Bay Trail Run starts at Eagle Point and takes runners around Emerald Bay and up the Rubicon Trail to D.L. Bliss State Park to finish at Lester Beach. The course is 7 miles / 11k point-to-point and features mostly single track with moderate climbs and descents. The trail is somewhat technical with natural granite steps. It is hard not to look at the stellar views of Lake Tahoe while running! Plan on bringing the family and spending the day for this race. Emerald Bay State Park is considered one of the most beautiful areas in the United States. Carved by ancient glaciers, Emerald Bay offers unequaled scenic hiking and trail running. There’s also a post event party with music, food and beverages, raffle, awards and swag from race sponsors. Tahoe Flume Trail Fall Classic Photo by Scott Rokis, official event photographer. The Great Trail Race is an epic point to point route between Truckee and Tahoe City, CA that you can either ride or run. Choose one of two course options, Elite or Classic. The Elite course adds in more technically challenging terrain and distance. Make the event the goal of your summer training, then dig deep and beat your age-group rivals. Or set your own pace and enjoy a beautiful Tahoe mountain bike ride, Tahoe trail run or walk through the Sierra forest. Whatever your speed, this is one race that you’ll be psyched you did! The Great Trail Race is a fundraiser for Tahoe Nordic Search and Rescue on a similar course to the Great Ski Race. Check out the event website for more details. Let us know in the comments below what race(s) you’re going to do this summer and stop by Tahoe Mountain Sports in Truckee for all of your trail beta and racing needs! 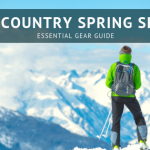 Previous PostBackcountry Spring Skiing Gear Guide Next PostWinter Gear Sale Starts Now!